Bowls and prints out the door! 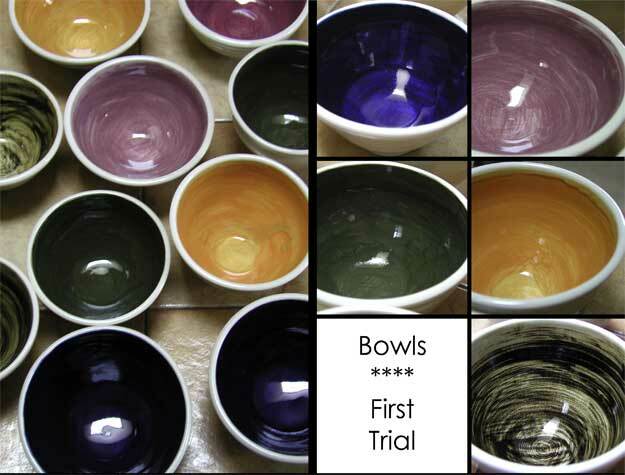 I had a few side emails from friends & family wondering how the bowls turned out. Nothing exploded in the kiln, which is a good thing! They were plopped into the kiln on the damp side after glazing. Those muffled thuds must have come from the neighbors house, not my garage. This is all a learning experience that will get tweaked a tad more with each batch to come. Color intensity was lost with exception of the blue. I need to apply the underglazes evenly & thicker for more intense color. The overglaze changed the maroon & cinnamon quite a bit. More experiments to come including one to really check the clay shrinkage. Part of the bowls should head out the door today. It’s a nice feeling to know pieces of me are heading out into the world. 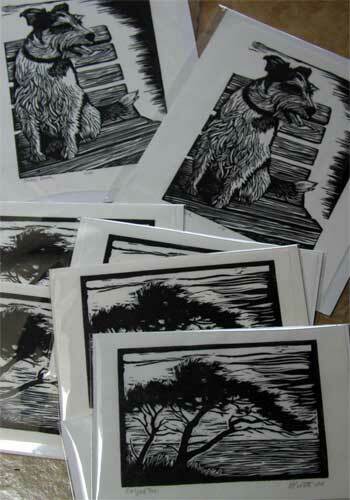 Some of the dog prints will also leave the house today. Last night I spent time packaging an Emma print order in addition to Evelyn’s Tree for family distribution. A Japanese paper order arrived yesterday so I can jump back into finishing editions. This week an invitation to show at a Corvallis venue arrived thanks to artist friend Julia Lont. Nice! Yikes! I have a few ideas popping thru my brain but it has to be ready by the beginning of the year. Guess I’ll have to pull out the botanical prints (shooting star & camas) for the job and maybe a dog print? Cut paper botanical silhouettes? All of the above? We shall see! Don’t know about the color intensity, but the photo makes them look very nice. I especially like the swirly green. Glad you like that one Chris. Swirly… hmmmm. It was supposed to be cinnamon. Could be an interesting look…. more experimenting to come!